In Football Manager your footballing season could well be defined in a single moment. Your title was lost when you dropped those two points at home against this years relegation fodder. Your European adventure ended prematurely when your leading centre-back lost his head and was shown a straight red. Or, and this can be one of the most excruciating experiences in FM, your star £50M+ signing injures himself kicking a football and is now out for 6-7 months. Injuries are annoying occurrences that can destabilise your season. Losing your main playmakers may force you to change the way you play, lose your centre-backs and you’ll be weaker through the middle. The addition of the medical centre in FM18 is a brilliant feature that can help you to reduce injuries in the game. In this post I will be highlighting several ways in which you can reduce the number of injuries in your Football Manager saves. As you may have already seen, I was sacked within the first few days of the FM18 Beta being released. In response to this, I analysed in detail what went wrong and what I would do differently next time. One of the main factors I noticed was our high number of injuries, especially longer term ones to our key players. Here are some statistics for our season up until 13th December 2017. We suffered 32 injuries in the first five months of the season. Of these 32 injuries, 14 of them were either major or moderate (which means more than 1 week out). The last statistic is a fairly important yet ambiguous one. Over the season I mentioned that our key players were often the ones to suffer from long-term injuries. Perhaps this was due to their importance and my eagerness to play them as often as possible. These five players are Anthony Knockaert, Jose Izquierdo, Shane Duffy, Pascal Gross and Davy Propper. One of the new features in FM this year is the Medical Centre. Here, you can see a list of all of the injuries sustained in the season. As mentioned, after being sacked I analysed what went wrong and noticed how badly these injuries affected me. I made a plan of what I was going to do differently to help reduce the number and severity of the injuries my team suffered. Let’s take a look at some of the measures I put in place for my second attempt at managing Brighton in FM18. One of the first things I did when joining Brighton for the second time was to recruit two new physios. Both of them had 20 in the physiotherapy attribute and therefore would be better equipped at treating injuries than a physio with a lower attribute. This is a big one. A feature of the new medical centre is risk assessments that are carried out on our players. As you can see from the far right column, each player is given an injury risk status. I found that in my first attempt with Brighton that many players were actually at ‘very high risk’ of injury as shown below. By monitoring this screen, I was able to plan who I was going to play and who I was going to rest for upcoming fixtures (more about resting players later on). Being in control of training has allowed me to easily reduce the risk of injury shown in the medical centre. But how? Highlighted in the red box is the main focus and intensity of our training. In my first attempt with Brighton I left training for my assistant manager to deal with. This was an error. He decided to keep a high intensity of training during some of the busier periods of the season, thereby increasing the risk of injury. In attempt two, I ran training and maintained an average intensity of training throughout the season. Over the past few FM’s we have seen the increased prominence of match sharpness, the percentage that sits next to overall condition. Match sharpness relates directly to risk of injury. The higher the percentage, the lower the risk of injury AND the lower in which a players condition will fall in a game. I paid more attention to this during my second attempt and ensured that players with low match sharpness would be given game time in the reserves to build up their match sharpness. This is perhaps the biggest change I made in my second attempt with Brighton. During busy periods, or after a tough physical game, I would select my match squad and set them to rest for a certain period of time, usually 2-3 days. You can do this as shown below. Rest days allow a player to recover their overall condition quicker, meaning that by the next game day they will hopefully be closer to 100% overall fitness. I also made sure that I rotated my squad more than the previous save. This allowed some of my key players time to rest and recuperate before their next match. 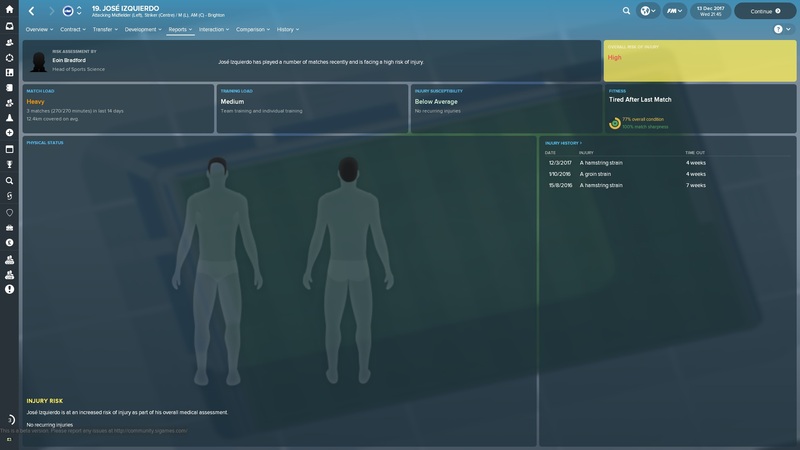 The medical centre is a BRILLIANT feature on this years FM, but only if you use it! Let’s see if these five areas I improved have actually helped to reduce injuries in my second attempt with Brighton. So, I recorded the statistics of injuries on the same date as the previous save: 13th December 2017. Have my improvements made any difference to the injury count? So, overall we saw a decrease of 6% in terms of total injuries. These injuries meant 373 days of football were missed, a 13% decrease on attempt one. The biggest and most noticeable statistic here is the days out between our top five players. Anthony Knockaert, Jose Izquierdo, Shane Duffy, Pascal Gross and Davy Propper suffered just 36 days out between them, a massive drop of 76% compared to our first save. Statistically yes, but let’s not forget that other factors do come into play. Luck – is it possible that my players were highly unlucky in attempt one and just luckier in attempt two? Tactics – our tactics changed over the two attempts, maybe one saves’ tactics were more aggressive than the other? Transfers – I made different transfers over the two saves, did these differences affect the number / severity of the injuries? Short period of time – I’ve only monitored these injuries for five in-game months (partially down to being sacked on boxing day in attempt one). My data would be more reliable if I were to record the statistics over a longer period of time. What do you think of the points mentioned in this post? Do you have any other tips to add? Please make use of the comments section of this post. Share your ideas and thoughts with other FM’ers! I’d like to thank you very much for reading this post and feel free to comment below your thoughts. Have you suffered injuries on your Football Manager saves? Do you have any more tips on preventing and reducing injuries on FM? 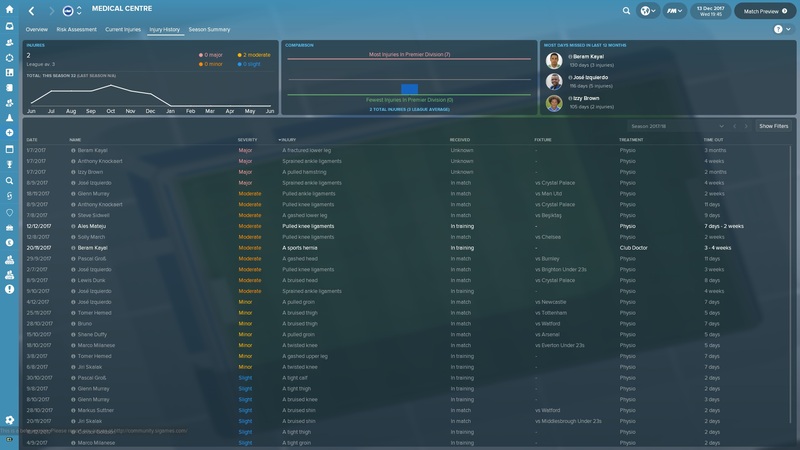 This entry was posted in FM18 Guides, Experiments & Wonderkids, Football Manager 2018 and tagged brighton, england, FM Guides, fm18, football manager, injuries, medical centre. Bookmark the permalink. how do you access the menu to rest multiple players, I cant find it? I can only do it individiaully.